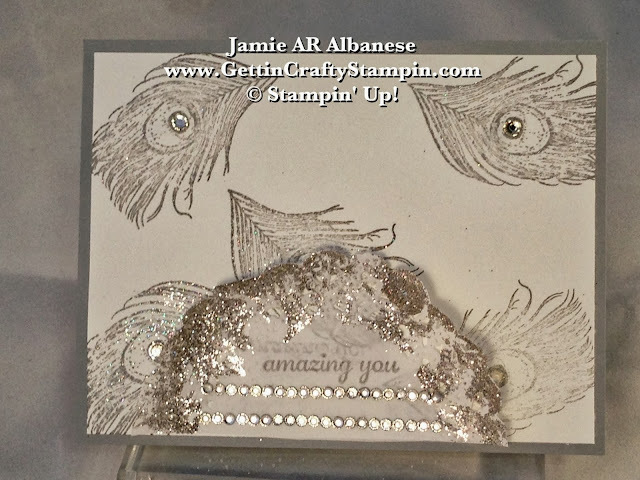 Getting Crafty with Jamie: It's Amazing How You Sparkle! It's Amazing How You Sparkle! There are times when it's fun to celebrate someone who lights up your life! They Sparkle and Shine. 'Amazing You' covers so many celebrations and this vintage inspired card is sure to bedazzle whomever receives it! 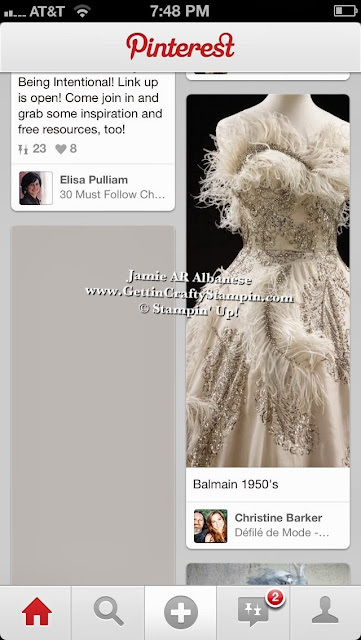 Created to celebrate an amazing friend... this card is inspired by this stunning vintage dress! This dress took my breath away! a fun Pinterest Pin... 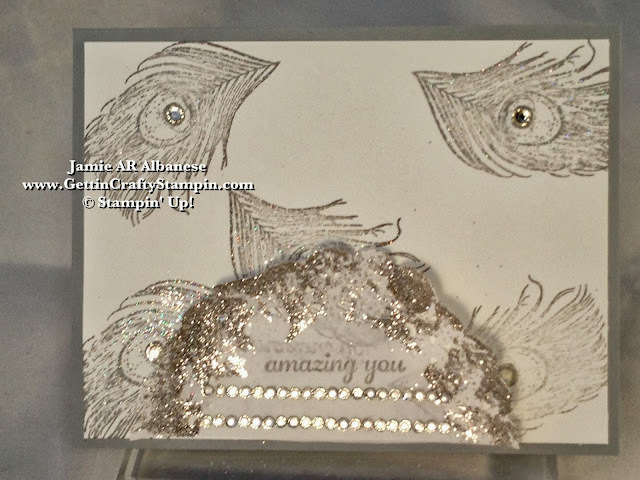 I just couldn't resist creating a jeweled, feathered card that is sure to add bling to a friend's day! This Mono-Chromatic card is far from one-dimensional or dull, lol. The base of Smoky Slate card stock (#131202) gives me a soft grey look. This Smoky Slate picks up the attributes of silver... I love 'chameleon' colors like this. Stamping the Fine Feathers (#126517) in Smoky Slate ink (#131179) on Whisper White card stock (#100730) and quickly cover the wet ink with Iridescent Ice embossing powder (#101930). Heat set with our Heat Tool (#129053). This glittered embossing powder is clear with pretty flecks of iridescent sparkle, oh so pretty! Placing adhesive backed Rhinestone Basic Jewels (#119246) in the center of the Peacock feather for a rich jeweled look! Taking Tea Lace Paper Doilies (#129399) and add adhesive to the edges. Here this Multipurpose Liquid Glue (#110755) with the broad tip (it has two tips for different needs). 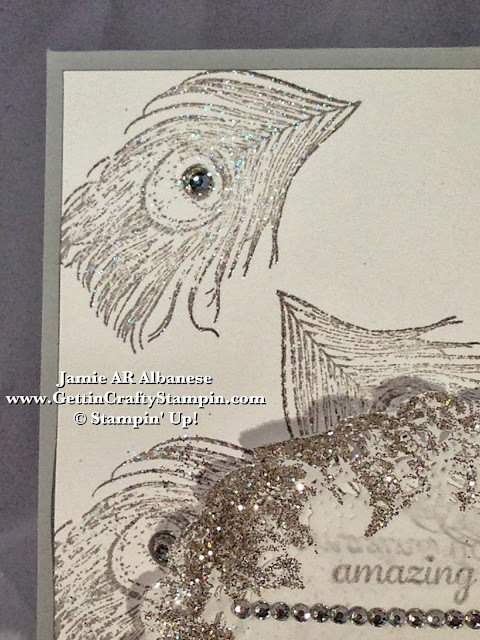 Apply the Silver Stampin' Glitter (#132205 - Holiday pg.29) for a fun effect. 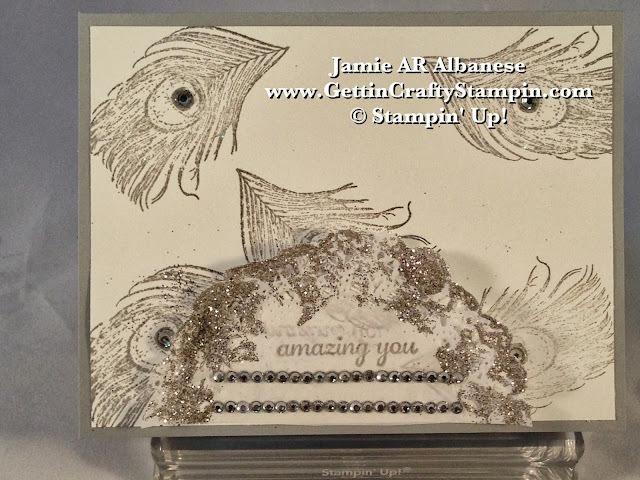 Amazing you is from the Hostess Exclusive Express Yourself stamp set (#130339). Join me as a Hostess for a Private Class where I bring you the fun and you earn the Shopping Spree! Stamped in Smoky Slate ink, framed with these linked adhesive backed Rhinestones (#119246) for an uber fun blinged card! Thanks for coming by! I hope you enjoy this card and that it adds a little sparkle to your day. I try to post daily and hope to see you often. Tell your friends and family about me... and leave me a comment on what you think. Surely you have a jewel of a friend in your life. Someone who sparkles and shines?? With multi-levels of sparkle and shine, anyone who receives this is sure to be bedazzled!! Celebrate this special person who is a jewel in your life! A fun card, inspired by a stunning vintage dress for a fun person!